The global wound debridement (wound cleaning) market is prophesied in a report by Transparency Market Research (TMR) finds intense competition and high fragmentation owing to presence of strong players in the market. 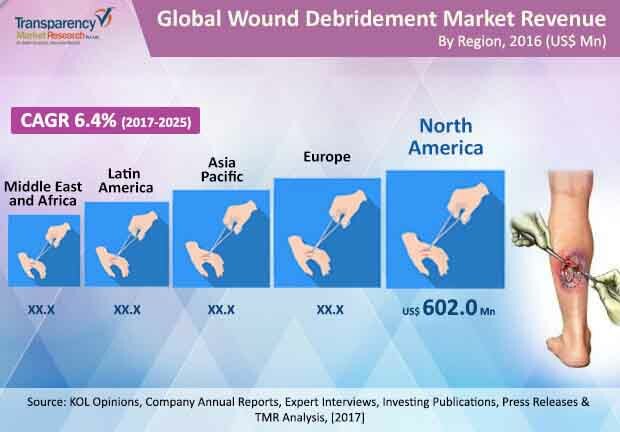 Some of the key players identified in the global wound debridement (Wound Cleaning) market include Zimmer Biomet, Smith & Nephew plc, BSN Medical, Lohmann & Rauscher International DeRoyal Industries, Inc., Arobella Medical, LLC, Misonix, Söring GmbH, and Derma Sciences Inc. In terms of value, the global wound debridement market is estimated to increase from a value of US$ 1,750.0 mn in 2016, to US$ 3,044.8 mn by 2025 at a CAGR of 6.4%. Mechanical wound debridement products & devices segment is expected to be the fastest growing segment of the over the forecast period, owing to high incidence of minor injuries and efficient in debridement of acute at significantly low cost. The chronic wounds segment accounted for maximum revenue share of 47.1% in 2016, and is predicted to hold its dominance throughout the forecast period. North America is projected to dominate the global market. Some of the reasons behind this dominance in the North America market are favorable reimbursement scenario for wound dressing products and wound care devices in the wound care (debridement) market. Cleaning and removal of the necrotic tissue by debridement products is very key factor boosting adoption of wound debridement (wound cleaning) products. It removes the devitalized or dead or contaminated tissues by lowering risks of attack from any foreign material such as microbes and toxins substances which constrain healing. Increasing geriatric population coupled with growing adoption of wound debridement products in homecare products, and increased awareness among patients is expected to boost the growth of the global wound debridement products market in near future. Additionally, increasing incidence of the chronic wounds and minor injuries, efficient in debridement of acute and chronic injuries are fuelling growth of the global wound debridement (wound cleaning) market. However, higher demand for low-frequency dressings in acute care settings, lack of standard usage guidelines are hampering growth of global wound debridement (wound cleaning) market. Additionally, it require trained manpower which is majorly restraining growth of the global wound debridement (wound cleaning) market. Lack of knowledge of these products from the developing countries is crimping growth of the global wound debridement (wound cleaning) market. Nevertheless, traditional wound debridement products and mechanical debridement pads are the major revenue contributor in most of the regions owing to its advancements offered. This higher adoption from these products are creating lucrative opportunities in the global market for wound debridement (wound cleaning) products.